As much as I love cooking hot food and racing against time to plate, style & photograph the dish (all before it goes cold!) I thought I’d make my life easier and this time bring you a delicious, chilled summer smoothie that’s healthy and full of energy boosting ingredients. Having tasted, adjusted and tasted again, I am more than confident you will love this recipe as much as I did. It’s so easy to make and tastes just as good as anything you’d buy from a Smoothie Store, but at a fraction of the price! 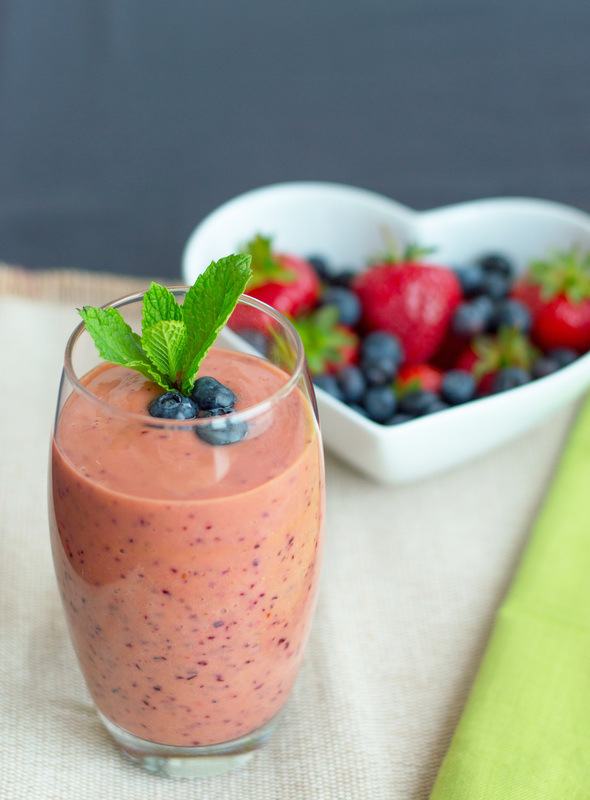 The combination of strawberries, mango, blueberries and mint, makes this Summer Berry Smoothie incredibly refreshing and on a really hot, add an ice cube or too. Enjoy! Combine the ingredients and place into a blender. Blend on a low setting until smooth, usually 30 seconds. If too thick, add an extra tablespoon of yoghurt. Taste and adjust with extra fruit if required. Hey Adam, its great drink with mixture of berry and it makes us fit and healthy and your job is great. Thanks for your perfect recipe. You’re welcome Janine, so pleased you like it!